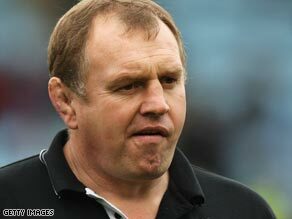 Former England forward and Harlequins director of rugby Dean Richards has been banned from coaching for three years for his part in masterminding a fake blood injury to one of his players. The 46-year-old was hit with disciplinary action after a hearing by an independent European Rugby Cup (ERC) panel found he had “organized the fabrication of a blood injury” on wing Tom Williams during a European Cup quarterfinal match against Leinster. With his side trailing by one point Williams, under instructions from Richards, faked a cut in his mouth with a capsule of fake blood, thereby allowing goal-kicker Nick Evans to return to the field of play. The plan may have worked if Williams had not winked to the oncoming player as he left the pitch, an action that infuriated their opponents Leinster. The ERC confirmed in a statement on their official Web site that Richards had acknowledged his role as the orchestrator of the plan that has since been dubbed “bloodgate,” and the subsequent cover up of the injury. Richards was initially cleared of improper conduct by a hearing in July in which Williams was given a 12-month ban, but the verdict was challenged by ERC disciplinary officer Roger O’Connor. Further evidence came to light in an appeal made by Williams before an admission of guilt by Dean Richards, who recently resigned from his position with Harlequins, prompted the ban. The ERC appeal committee chairman Rod McKenzie said details of four other incidents of Harlequins faking injuries had been passed to the relevant authorities. Williams’s ban was reduced to four months and the fine imposed on Harlequins has been increased from $340,000 to $425,000 — the club still awaits to hear whether they will be expelled from this season’s European Cup. The physiotherapist for the London-based club, Steph Brennan, has also been banned for two-years. Richards had not decided whether to appeal to the Court of Arbitration for Sport but reacted to his ban by telling reporters: “I’m surprised. Three years is a long time but I’ll reflect on it overnight. “I took full responsibility for it. It was a farcical situation, it really was. It didn’t pan out particularly well on the day. Everybody looked at it and thought, ‘That’s unreal’, which is what I thought on the touchline as well. “But I had to hold my hands up,” Richards added.